Many golfers possess a copy of the Rules of Golf book. 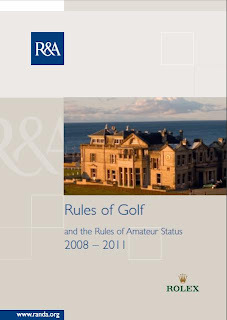 In some countries the R&A provide free copies to Club members, thanks to the generosity of Rolex, the official sponsors of the Rules book. The USGA charge a nominal $2 on their web shop, but currently you can purchase it for just $0.80 cents. But, and this is the crux of the matter, most of those that own a copy of the Rules book have only scanned through it, without learning much. No doubt, the reason for this is that it definitely is not an easy read and, until you have become well acquainted with the Rule numbers, it can be very difficult to find a particular ruling that you are searching for. "A 'stroke' is the forward movement of the club made with the intention of striking at and moving the ball, but if a player checks his downswing voluntarily before the clubhead reaches the ball he has not made a stroke." So, we can see that a ‘fresh air’, or ‘whiff’, does count as a stroke, as there was intention to strike and move the ball. Whereas, if a player aborts his stroke on the downswing, as Tiger did in the 2007 Masters, it does not count as a stroke because there was no such intention. Try it out, read through the definitions and see how much it helps your understanding of the Rules. If you don’t have a copy of the Rules book to hand you can read from an on-line version here . ** I truly believe that the easiest and most enjoyable way to absorb and understand the Rules for golfers of all playing abilities is with my book, ‘999 Questions on the Rules of Golf’. Readers can work through a series of questions, answers and, most importantly, explanations to the myriad situations on the golf course that they will recognise and relate to. Answers are conveniently located immediately beneath each question and are directly referenced to the applicable Rule of Golf, or Decision on the Rules. A detailed index provides an easy and convenient way for readers to reference specific situations as they arise. Watch out for my next blog for my special Christmas gift promotion on 1, 2 or 3 copies. I'd buy a copy of the R&A book just for the cover ! There aren't any better views for a golfer than the R&A building behind 1/18 at St Andrews.